Running a bar can be a barrel of laughs and a hectic enterprise, but the process is made simpler when a bartender knows the basic drinks that most customers order. These five cocktails are necessary weapons in a bartender's arsenal. A smooth and sophisticated cocktail that was popularized, in part, by Ian Fleming's fictional British spy, James Bond, the martini is always one of the most requested cocktails. Martinis range in ingredients and flavors, but understanding the basic recipe for a classic martini is a great place for bartenders to start. You can add different flavors, juices, liquors, or add-ins depending on the customer's preferences. 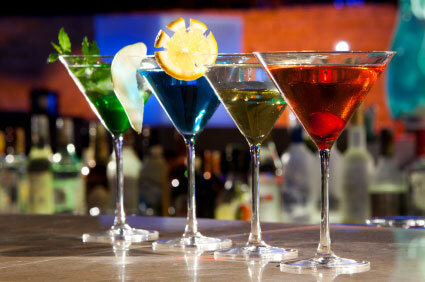 The liquor used in a martini is either vodka or gin, and the customer will typically tell you his or her preference. The International Bartender's Association lists the official martini ingredients as four parts gin and one part dry vermouth, a special wine used almost exclusively in martinis. These ingredients are shaken with ice and strained into a martini glass. The martini is usually garnished with an olive, but sometimes this beverage is garnished with a cocktail onion and referred to as a Gibson. Variations include mixing the liquor with olive juice, garnishing with a twist of lemon or lime, garnishing with a cherry, or using another liquor besides gin or vodka. A margarita is a classic Mexican cocktail that features four parts sweet and sour mix, lime juice and simple syrup can be substituted, two parts tequila, and one part Triple Sec, an orange liqueur. This cocktail is usually served on the rocks in a Margarita glass with a rim that has been dipped in lime juice and sea salt. Margaritas are often garnished with a lime. Frozen margaritas are blended with ice to form a slushy beverage, and margaritas are often combined with other flavored juices such as pineapple, mango, or watermelon juice. An Old Fashioned is a bourbon-based cocktail that is made by adding a sugar cube, a splash of bitters, and a splash of soda to a glass. This mixture is muddled with a spoon, the drink is filled with ice cubes, and bourbon whiskey is poured over the sweet concoction, filling the glass. The drink is usually garnished with a cherry or an orange slice. A Manhattan cocktail began as a variation on the classic martini that was popular in the Manhattan region of New York. This beverage uses Canadian Whiskey in the place of gin or vodka, and it often is paired with sweet vermouth rather than dry vermouth. Three parts whiskey and one part vermouth are paired with a dash of bitters. This liquid is then shaken with ice until it is very cold and strained into a martini glass. The Manhattan is sometimes mixed with maraschino cherry juice to give it a sweeter flavor. A Tom Collins is a summery cocktail served over ice in a tall narrow glass. Gin, simple syrup, lemon juice, and soda water are mixed in the desired concentrations and strained into a glass filled with ice. This drink is usually garnished with in-season fruit such as oranges and cherries.